If you haven't visited Darlene's blog over at It's an Inkin' Stampede, you are missing some great posts. This week's technique is so beautiful I immediately wanted to feature it here. Darlene had already made the video, but for any of you who are unable to view it, I have captured some images and added brief instructions. Start with a circle of cardstock with a hole punched in the center. Darlene used a 1-3/8" circle. You will also need two and a half cardstock butterflies. She is using a punch sold by Stampin' Up! 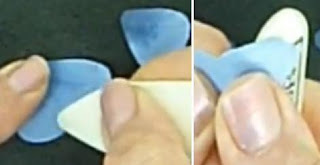 Use a sponge to add color to the inside edges of the petals. 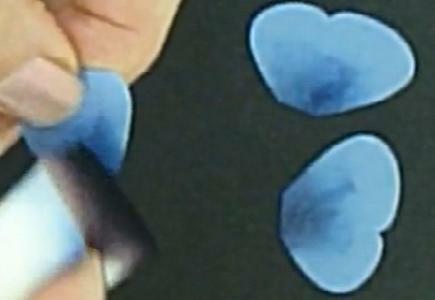 For the pictured petals, Darlene has added blue and purple ink. Neatness and uniformity aren't necessary. Every flower has its own individual flair. The video shows an option of adding glitter to the top two petals. I have omitted that step here, because we don't use glitter at OWH, for the safety of our heroes. If you want to try this technique and you don't have a butterfly punch, be sure and visit the blog hop this weekend. I'll be giving away butterflies as blog candy on my blog hop post! 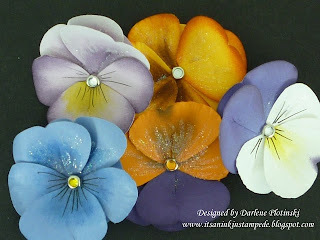 Visit Darlene's blog or leave a comment and let us know what you thought about today's tutorial. Also, if you have an idea for a tutorial, or would like to demonstrate a technique, please write us at challenges@operationwritehome.org. Thanks again, Darlene for sharing this technique with us! Wow, these are gorgeous flowers! Great tutorial I wish I still had that SU butterfly punch ;)! Jan, be sure and stop by my blog on Saturday. I'm giving away punched butterflies to ten lucky hoppers! I don't have a butterfly punch the right shape... but I used her idea to make some little violas with a shell punch. It's more fiddly because it's a lot smaller but they're cute! I love this tutorial!! Thanks for sharing. Those are very cool, I'll have to try them. Wow these flowers look so real I want to stop and smell them too. Thanks Darlene for a wonderful video tutorial. As a new card maker I know I too can make them with all the wonderful tips you shared. Wow I have tried to make these many time and they never came out right. I love this tutorial! Thank you I can't wait to try it! I don't have a butterfly punch, but I tried this with my heart punch. I'll keep playing with it, but the result was not bad. Thank you for sharing!